Get ready to LAUNCH a “spacial” theme birthday party that’s out-of-this-world! Here are a few space theme party packs for you to compare with. Instead of Space Shuttles you can cut out stars, planets, aliens etc. Here’s a similar but different variation for the wording: what you can write on the front of the invitation: ” 3… 2 … 1… Blast Off!! !” And here’s what you can write on the inside: “Please join us for an ‘Out Of This World’ party celebrating [child’s name] 6th Birthday! Blast off: Saturday, January 12, 2009. Count down begins at 1600 (4:00 p.m.) Space Station: (put your address here), R.S.V.P. to [child’s name] parental unit: Harry and Claire Mills (555) 555-5555 (put your phone number here)”. It’s a great idea to designate a SPACE ROOM! First you need to cover the windows with either black blankets or black plastic (like the gardening plastic used for flower beds). You can move the furniture away from the walls and cover them with white sheets for “moon rocks”. You will need a Black Light to create the Space effect and you can also use green bulbs for an eerie green glow throughout the house. It’s a nice touch to add Space-related birthday party signs. Here are two examples you can use (decorate your party area to resemble a space ship control station): “Launch Status Center” and “Control Station”. You’ll need a whole bunch of inexpensive glow-in-the dark items to hang up in the SPACE room and to hand out to the little astronauts (the kids love’em!). Paint foam balls (using Glow-in-the-Dark Spray) and hang them from the ceiling with fishing wire so it looks like the planets are hanging in mid air. You can also paint rocks with the same glow-in-the-dark paint and disperse them throughout the space theme birthday party areas. A really cool idea is to shove glow sticks into green balloons. Then draw and alien face on each balloon with a permanent marker. Great as a space party decoration! Next, cut out planets, moons and stars from fluorescent poster boards. Punch holes in the planets and hang them from the ceiling. You can make alien heads by blowing up green balloons and drawing black ovular circles for the eyes and two dots for the nose. Then attach these to tables and chairs. For tablecloth, use scrunched-up aluminum foil to create a cool celestial look. You can also make flying saucers by stapling two plastic plates turned upside down and hang them from the ceiling as well. The floors can be covered with an assortment of balloons. Silver and white balloons would probably fit best into the space theme birthday party. Put glow in the dark items inside the balloons for an awesome effect! Take a look at all the coolest homemade Space costumes. When the kids arrive to your Space theme birthday party, have them prepare air packs (2 liter bottles taped together with duct tape straps). You can spray these with quick-drying silver spray paint. You can also have them decorate it with some color glow necklaces and other glow in the dark stickers to create an amazing effect in the Space room. The kids can decorate Flying Saucers (made out of two paper plates turned upside down, stapled together and a clear plastic bowl fastened to the top) with markers, glitter and sparkly jewels. These can be used later towards the end of the theme birthday party (after the glue dries) in an outdoor contest to see whose flying saucer flies the farthest. You can also get a bunch of Frisbees, have them decorated and use them in one of the games below. A great ice-breaker for all parties are Space coloring pages! You set a table with markers, crayons, or anything else the kids can paint with and let everyone color in Space coloring pages until all the guests arrive. Prepare a whole basket of craft materials (such as toilet paper tubes, yarn, eyes, pipe cleaners, tissue paper, glue, tape, etc.) and let the kids use their own imagination to create alien beings. To make the goo pour a one pound box of cornstarch, a cup and a half of cold water and a tablespoon of green food coloring in a big bowl. Then mix with your hands until the mixture is smooth. You can put a glob of alien goo in little plastic bags and give each kid one to play with (if the goo gets too dry, add a little more water). Take a look at all the coolest homemade Space birthday cakes. Tip: In ice cube trays put green food coloring for green ice cubes. Jell-O Planets (Make blue Jell-O for the sky with floating planets inside using green and purple grapes. Be sure to put the grapes in when the Jell-O is half set, so they don’t sink to the bottom. Glowing Jell-O Jigglers – Make Jello Jigglers cut into cubes – Margarita flavored jello turns out to be a cloudy solid-ish mint green – very unique looking from other flavors. Serve them in a bowl or platter that contains saran-wrapped glowsticks. It produces an eerie alien glow! 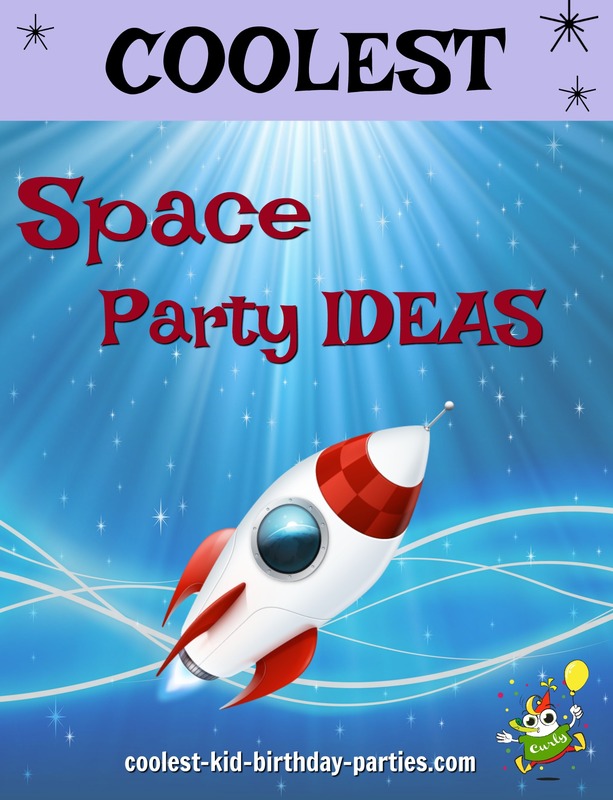 After throwing such an AWESOME space theme birthday party, you’ll want to have the kids re-enter the atmosphere with some impressive space favors. Items can include rocket pops, pop rocks, space pencils, moon balls, glow-in-the-dark stars, space stickers, Mars bars, alien key chains, glitter pens, metallic markers, rocket erasers, bottle of bubbles, little flying saucer Frisbees, space yo-yo’s and lots of other glow-in-the-dark items. You should also read these VERY important tips to help you survive (and enjoy) game time! OK, now we’re ready for an out-of-this-world Space theme birthday party! 5… 4… 3… 2… 1… BLAST OFF! !